Unforgettable Big Band was founded in the summer of 2000 by Steve Spangler, a saxophonist, and resident of Lake Meade, near East Berlin, Pennsylvania. Steve loved big band music, and was able to find a few friends nearby who shared his interest. Steve consulted Jim Spark, newly appointed Minister of Music at First Presbyterian Church in York, who formerly toured as a member of the band True Reflection, and together they formed what would soon become Unforgettable, with Spark as musical director and Spangler as band manager and owner. Steve was able to draw on his friendships with area musicians, and with contacts within the church to assemble an early core of musicians who gathered once every two weeks in Steve's garage to play big band classics. Although the band was formed for the enjoyment of playing the music, word spread around the community, and within a couple of years, the Lake Meade Homeowners Association asked the band to perform for their annual charity fundraiser dance. This would be Unforgettable's first public appearance, and the dance was such a success that it became an annual event performed each year by the band. The following year, the association began holding two dances each year, featuring Unforgettable Big Band, and these annual events have raised more than $25,000 for local charities. As word spread, Unforgettable began performing more frequently throughout the York area. With proceeds from performances for local charity groups and churches, Steve was able to purchase a sound system and stage lighting. As the band grew, and through turnover of musicians, more and more of the band's core came from the York area, and for convenience rehearsals were moved to First Presbyterian Church in York. Additional performances at area retirement communities swelled the band's schedule to 10-12 appearances annually. By the later part of the decade, Mr. Spark's schedule no longer permitted his full involvement with the band. Spangler, eyeing retirement, and a bit stressed from the multitude of tasks involved in scheduling, moving equipment, and coordinating all activities, along with the added responsibilities of rehearsal planning began to consider stepping down, and in early 2010, he decided to step away from the band. The members of the band organized, and incorporated as a 501(c)(4) non-profit, and purchased the accumulated assets of the band, including the sound system, lights, and music library from Steve. In short order, a constitution and bylaws were developed and adopted, and the band elected a board of directors which appointed musical directors to handle band responsibilities, and the band entered its second decade with new leadership. Since 2010, Unforgettable has more than doubled its public appearances, and has seen dramatic growth in awareness. The band has developed a strong following, and regularly plays to capacity crowds at venues throughout the Susquehanna Valley. Since 2013, Unforgettable has released two CD compilations, and a digital single of an original composition by vocalist Tonia Grubb. 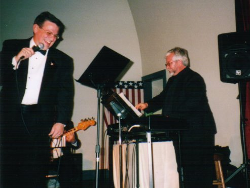 In 2012, Unforgettable performed as the feature band at the centennial celebration of the birth of Les Brown in Reinerton/Tower City, PA. During our 15th anniversary season in 2015, the band performed for a packed house at Elks Lodge #213 in York, PA for a special 91st birthday tribute to Doris Day, who got her start in the entertainment industry with Brown and his Band of Renown. Unforgettable closed out 2015 with two sold out performances of a centennial tribute to Frank Sinatra at York Little Theatre. Unforgettable Big Band is grateful for our last 15 years as a part of the musical fabric of York County, PA, and we look forward to a long history yet to be written performing the greatest music ever written.